THE STORY - An FBI agent teams up with a veteran game tracker to investigate a murder that occurred on a Native American reservation. THE GOOD - Jeremy Renner's quiet and brooding performance. Taylor Sheridan's ability to tell his story with the landscape being a true main character. THE BAD - Elizabeth Olsen's character is under written. Not as well made as Sheridan's previous films which he only wrote, while this time he's writing and directing. ​Taylor Sheridan has certainly positioned himself to be one of the new exciting filmmakers of our time. After writing his first screenplay for the critically acclaimed “Sicario,” he then went on to earn himself an Academy Award nomination for Best Original Screenplay for “Hell Or High Water.” Now he is back writing his third screenplay and it also marks the first time he is in the director’s chair. I am one hundred percent convinced that Taylor Sheridan has a great film in him some day. For now, “Wind River” is a good film that works better when it's taken within the much larger context of what Sheridan’s three produced screenplays all have in common. When a young girl’s body is found raped, beaten, bloody and frozen in the snow by hunter Cory Lambert (Jeremy Renner) on the Wind River Indian Reservation, 6 miles from the nearest shelter, the FBI is called in to handle the crime. A young FBI agent named Jane Banner (Elizabeth Olsen) is sent in from states away to solve the case. With the weather elements being as harsh as they are and the locals not being that much simpler to deal with, Jane asks for Cory’s help in catching the perpetrator and bringing him to justice. Cory agrees to assist due to the personal connection the case has to his friend Martin Hanson (Gil Birmingham) and Cory’s own dark past. I currently cannot think of another filmmaker off the top of my head who has utilized the landscape and the culture of the people who live within that environment to their advantage as Taylor Sheridan does. All three of his screenplays have a unified theme of the current state of America through the unique environments found within. Most people will immediately think of large cities or suburban neighborhoods when they think of America. Sheridan instead thinks back much longer than that. He is concerned about the history, the legacy and the slow changes that have developed over the time as a result of us simply living here. Whether it’s the Mexican border, or the poor West or in the case of “Wind River,” the barren snowy landscape that has cast a dark and depressive mood over those who live within its rough terrain and elements. The environment shapes his character’s way of thinking, of speaking and helps to give his films a distinctive voice and message that is utterly fascinating. 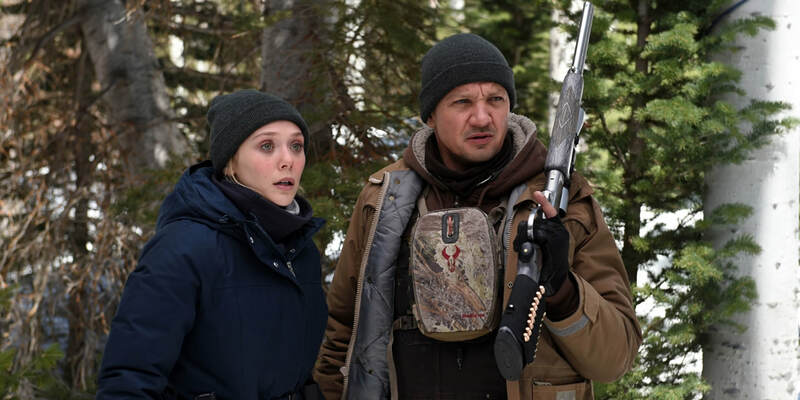 Now, taken as a standalone film, it is clear that “Wind River” is a debut film. Not cut as well in terms of its pacing nor as visually interesting as “Sicario” or “Hell Or High Water” even Sheridan’s dialogue is not as strong. Maybe the burden of expectation is looming over the film just as the bleak and snowy storm threatens to cover all in its path. “Wind River” is without a doubt, the most disturbing, harrowing and depressive of the three films Sheridan has written so far. That dour mood is one that in the hands of a more skilled director could have helped to elevate the film to even higher heights but Sheridan does an admirable job regardless. If there is one thing I cannot fault Sheridan for here, it’s the casting of Jeremy Renner in the lead role and providing him with what is his best part in years. Renner reminds us once again that when he is not stuck within the world of Marvel or other big budget action films, he is one of the most powerful actors around. Someone who fares less is Elizabeth Olsen, a talented actress in her own right and also from the Marvel Cinematic Universe. Olsen is not to blame here. Sheridan just chose to give Renner the juicier role with a heartbreaking backstory and makes him the centerpiece of the film. Olsen is merely a supporting player and one wonders how this film would have turned out if the roles were maybe reversed? Brutal, chilling and unforgiving, the snowy landscape of Wyoming is an area within the United States that many will probably never visit and it's not hard to see why after watching “Wind River.” While not as well made or entertaining as his previous two produced screenplays, Sheridan’s third time as a writer and first time as a director is a solid effort from a remarkable talent that still has not yet made a truly awful film. I wait with great anticipation to see which unexplored areas of our country and our own humanity he chooses to explore next.